Socialcube is designed for grading with Christian Haschek&apos;s XP based grading system. On the site institutions (schools, universities, etc.) can be reigstered and teachers and students can join on a email- or code based invite system. 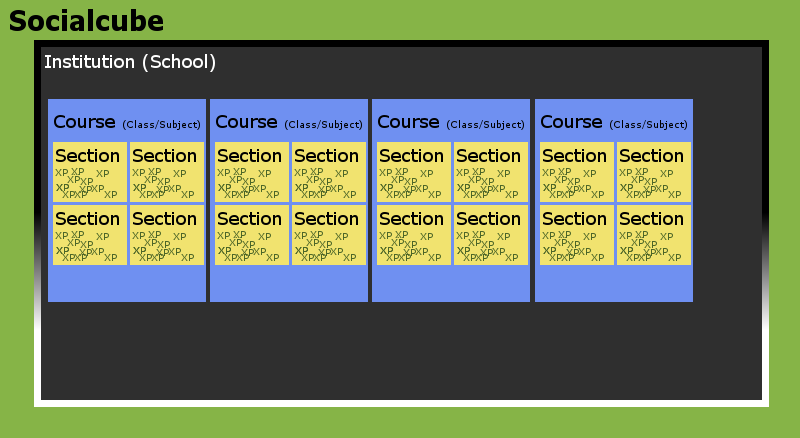 Every course can have multiple sections. Sections are usually the topics the teacher is teaching in this class. In these sections XP can be given to all students attending this course. A professor of MIT (Institution) teaches "Advanced computer science" (Course) and divides the course in the topics "cryptography", "bash scripting" and "game theory" (Sections). They give out an assignment in cryptography that will be graded in XP. Students who hand in the assignment receive a value of XP determined by the professor in the section cryptography. The goal of this API is to create an interface between the students performance and external sites. If you are a game developer you can reward your students in your game when they get XP in school/university.